In my work as a digital cartographer, I come across many sites on the internet that can be helpful to people who enjoy the outdoors. 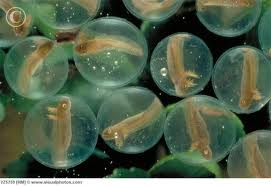 Below are two which you may find useful and lots of fun. Google, Yahoo and Bing all have their own mapping sites online. With some variation, they do a fine job giving you a street map version of the location you are looking at and also providing an aerial color photographic view, commonly called an “orthophotograph.” But sometimes you want to be able to look at your location using the old standard—a USGS topographic map. Or maybe you are doing some trail planning or exploring off trail and you want to see if there are any old skid roads or farm paths that you can use. Jef Poskanzer’s ACME Mapper provides many viewing options for the same location. You can switch between color orthophotographs, map view (roads), a hybrid of color orthophotographs and roads, USGS topographic maps, a shaded terrain map showing contours and shaded relief, black and white orthophotographs and other options. The beauty of using this site is that you don’t have to change websites or open new tabs or windows to view your location on the different map backgrounds. To see the same location in each of the different map types, enter the address, city, zip code or latitude/longitude coordinate in the search line in the box in the lower right corner or use the website’s map navigation controls. Once you have found your location, you can change the map type. The map type options are in the upper right corner. MAP is the basic Google street map. SATELLITE is the color orthophotograph background, HYBRID adds street names to the SATELLITE view. TERRAIN uses Google’s terrain feature which displays topographic contour lines with a nice hillshade component. TOPO displays the USGS topographic maps, and DOQ displays black and white orthophotographs. The DOQ option is nice because it displays photos taken when the deciduous trees have lost their leaves, making it easier to see landmarks such as roads, trails, stone walls, and small ponds. To see the benefits of this leafless view, zoom all the way into a forested area that you are familiar with. Now toggle between SATELLITE view and DOQ view. With the DOQ view, stone walls appear as linear features, farm roads and logging roads are no longer hidden beneath the forest canopy and concealed vernal pools may show themselves. The lower right hand box also contains other useful options. Using these options, you can print the current map view, send the link to the view via email, mark a location on the map and see the latitude and longitude of the centrally located crosshairs on the map. Select “ABOUT” to get the full descriptions of all the options. This is a fun and informative site that lets you create a viewshed from a location you choose. A viewshed is the view of the landscape that is visible to you from a particular point. How many times have you hiked up to a prominent point, looked out over the landscape and said, “Hey, what’s that mountain?” With this website, you can find out the names of the mountains, what direction they are in and how far away they are. By printing the information from this website and taking it with you on your hike, you’ll be able to locate and name the distant mountains just by using your compass. Here’s how. I’ll use the view from the Gile Mountain fire tower on Turnpike Road in Norwich, Vermont as an example. Start by finding Gile Mt on the website’s map. You can find the location by using latitude and longitude, by entering a location’s address in the search box or by using the website’s navigation controls to move the map to Gile Mountain. Once you find the location of Gile Mt. on the map, left click to place an X on the summit. There is an optional feature that lets you automatically move your X to the highest spot within 100 feet of your location to insure a 360° view. After moving my X to the new higher location, I took advantage of another option that lets you change the elevation of your observation point. I estimated that the tower was 60 feet above the ground so I added 60 feet to the map’s elevation of my X. After all, I wanted my viewshed to be calculated from the vantage point of the top of the fire tower. To get my results, I entered a name in the title box and selected, “Submit request.” Within two minutes, I had my viewshed information. High points visible from the Gile fire tower are marked by red triangles on the map. Clicking on one of the triangles will give you the name of that high point. When I clicked on a particular red triangle in the southern area of the map, a box opened that told me I had clicked on Mt. Ascutney, 207° and 24 miles away from Gile Mt., as the crow flies. The box also had the latitude and longitude of Mt Ascutney. In addition to the map showing the visible high points you can see from Gile Mt., on the right side of the screen is a list of visible highpoints, along with their compass bearing and distance. There is also a 360° profile showing all the high points you can see from the top of the tower. There are also options to print the list of highpoints and the 360° view. Have fun exploring these two websites. If you get stuck, make sure to look at each site’s FAQs. If you have any questions regarding these two sites, send me an email and I’ll try to help. 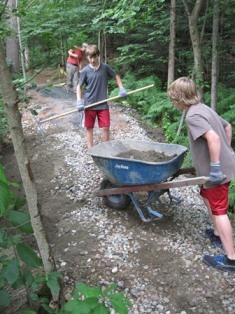 In April, Lester Kenway of Bangor Maine led a trail building workshop on the Gile Mountain Trail in Norwich. The two-day workshop was sponsored by the Upper Valley Trails Alliance and included a total of 12 trail-building enthusiasts, including folks from the UVTA staff, the Norwich Trails Committee, Students from the Dartmouth Outing Club, the Cardigan Mountain Highlanders and The Upper Valley Mountain Bike Association. Lester is the owner of Trails Services LLC, based in Bangor Maine. He has worked on trail projects in state and national parks all over the continental United States and Alaska. Lester trains and leads trail crews and sells hard-to-find trail building equipment. He is also an authority on Griphoist lifting and pulling machines. The griphoist is like a come-a-long with many safety features that allows trail crews to move large heavy objects, like rocks and trees, with the deft application of a mechanical advantage. Much of the workshop included hands-on safety lessons with Lester explaining the limitations and possibilities of this equipment. The highlight of the weekend was the erection of a 240’-long high-line through the woods of Gile Mountain. The grip hoist was used to tension this line which then allowed the workshop participants to move large rocks up hill through the woods. These rocks will be used to build stone stairs that are part of an ongoing trail hardening project on the popular and heavily used Gile Mt Trail. Please see the link below for the demonstration video of the high-line at work. 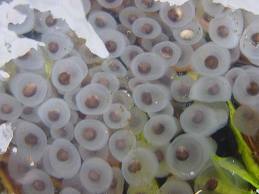 The video was produced by Ben Silberfarb of Norwich. The equipment was purchased by the Town of Norwich with a grant from the State of Vermont which was coordinated by UVTA. The griphoist and the associated equipment will be made available for use by local organizations through the UVTA. On Saturday August 11, 2012 the Dartmouth Outing Club, the Hanover Area Friends of the A.T., and the Town of Hanover will celebrate the 75th Anniversary of the Completion of the Appalachian Trail. A day of celebration of Benton MacKaye’s creation, the history of the A.T. and its manifestation. Local activities include guided day hikes with members of the Appalachian Trail Conservancy (ATC), the Hanover Town Trails Committee, the Dartmouth Outing Club (DOC) and the Green Mountain Club (GMC). The hike to Smarts Mountain for those wanting a mountain hike, a breath-taking view from the Lambert Ridge and the fire tower will be led by Matt Stevens of the ATC. Those wanting a pure escape-in-to-nature trail hike may join Heinz and Inge Trebitz of the GMC at Dan&Whit’s in Norwich. They will lead the trail hike from Elm Street, across Happy Hill, to Rte 14 West Hartford ending at the West Hartford Village Store. And for those who want ‘short and sweet’, Doug Mcllroy a Professor of Computer Sciences at Dartmouth and member of the Hanover Town Trails Committee will lead a hike from the Hanover Coop Service Station lot up to the Velvet Rocks. There will be the option to take a walk on the ‘wilder side’ of the Appalachian Trail and hike back the property line of the White Mountain National Forest. In the afternoon there will be a gathering on the front lawn of Robinson Hall at Dartmouth College with friends new and old, food, and fun. Highlights in the afternoon will include guest speaker Larry Anderson the author of Benton MacKaye’s biography, a display of historic DOC and Appalachian Trail documents, an opportunity to meet the current leaders of the DOC and more. Local community, Dartmouth students and alumni, and hiking enthusiasts unable to attend the weekend celebration in Harper’s Ferry Virginia are invited to this free event at Robinson Hall to learn more about Dresden, Dartmouth and the Appalachian Trail, and how their connections have shaped the landscape of what we know today as the Upper Valley. Get outside for some good times on trails. 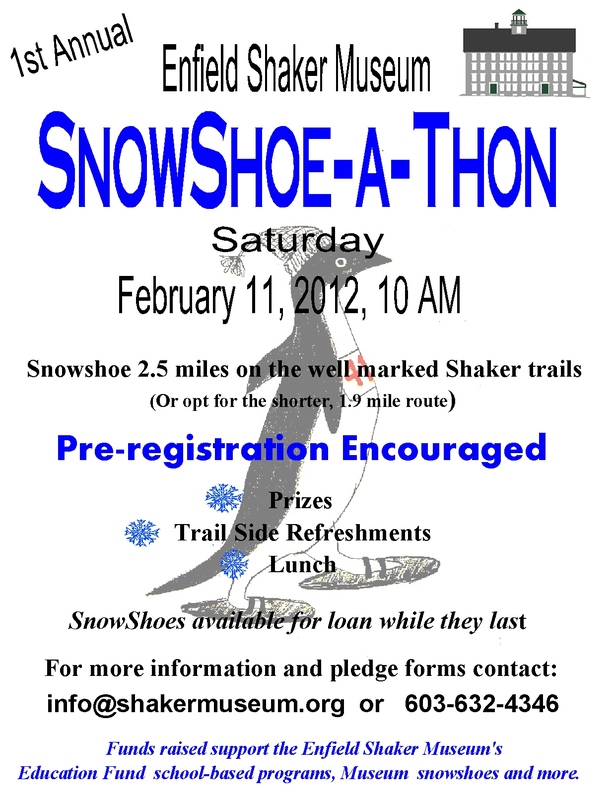 Paddle the Connecticut River Water Trail, bike the Northern Rail Trail, pitch in with your communities local trail building efforts, learn some new trail care skills, or be part of a major trail celebration. There’s lots happening on Upper Valley Trails Day ( In conjunction with the American Hiking Society’s NATIONAL TRAILS DAY). 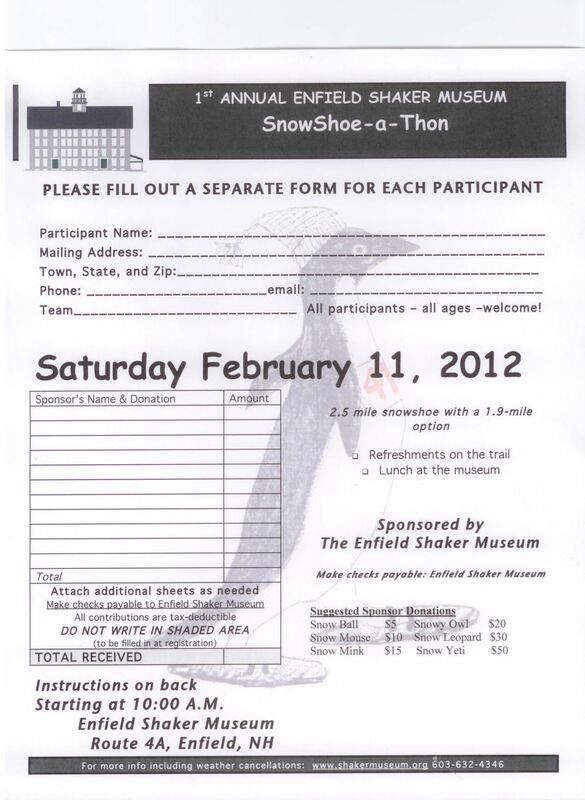 For a Listing of Upper Valley Trails Day events by Town click here. 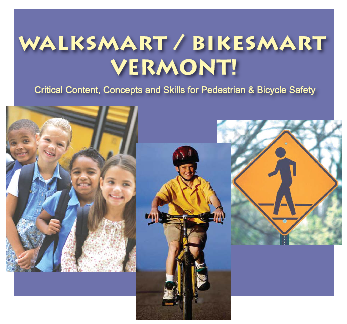 The Vermont Safe Routes to School Resource Center is pleased to offer the Walk Smart/Bike Smart Vermont! curriculum. Free trainings are provided through the VT Safe Routes to School program. The Vermont Safe Routes to School Resource Center is managed by the Vermont Agency of Transportation and is aimed at making it easier than ever for schools to participate in Safe Routes to School. Safe Routes to School is a federally supported program to encourage walking and biking to school regularly, routinely, and safely. SRTS integrates elements of transportation, economics, health and physical activity, environmental awareness, and safety into one program. Get outside with the Hartford Conservation Commission to explore the spring wonders at Hartford Town Forest. 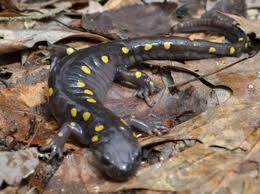 Free of predatory fish, Vernal pools provide the perfect breeding grounds for salamanders and several other amphibians. 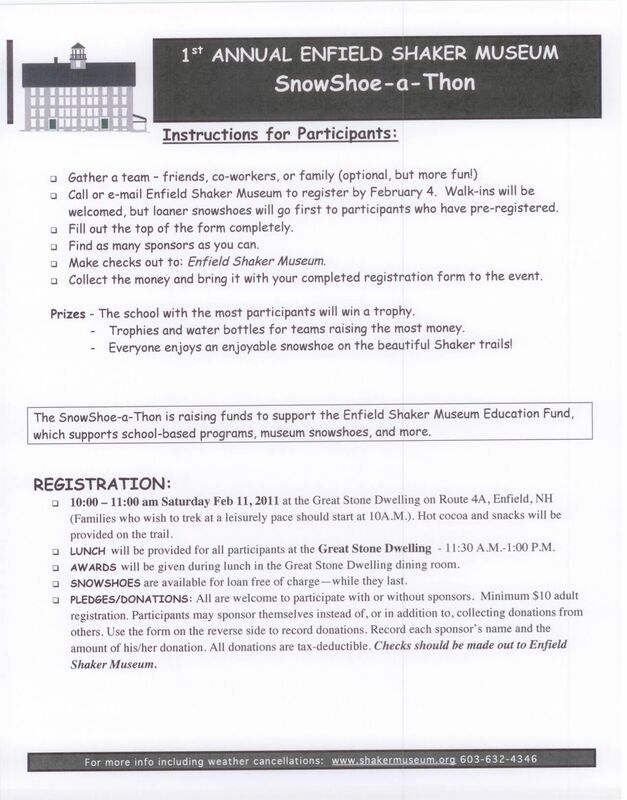 Funds raised support the Enfield Shaker Museum Education Fund which supports school-based programs, Museum snowshoes, and more.